Lost your money at the slots? Partied too hard at the clubs? Whatever your reason for getting out of Las Vegas, there are plenty of national parks to get away to. Check out driving distances and approximate drive times and plan on a day trip—or a few days away to recover from a city that never sleeps. Arches contain some of the country’s most amazing natural wonders—mammoth rocks and arches formed from erosion. Perhaps one of the most important facts about Arches is that the park is constantly evolving. In the past 30 years, two major collapses have occurred: A major piece of Landscape Arch in 1991, and Wall Arch in 2008. Both serve as reminders that these structures will not last forever—all the more reason to visit soon. No other national park showcases what natural erosion can build like Bryce Canyon National Park does. Giant sandstone creations, known as hoodoos, attract more than 1 million visitors annually. Many people take to the trails, choosing hiking and horseback riding to get an up-close-and-personal look at stunning fluted walls and sculptured pinnacles. In this geological wonderland, rocks, spires, and mesas dominate the heart of the Colorado Plateau cut by canyons of the Green and Colorado rivers. Petroglyphs left by Native Americans hundreds of years ago are also present. The Colorado and Green rivers divide the park into four districts: the Island in the Sky, the Needles, the Maze, and the rivers themselves. While the districts share a primitive desert atmosphere, each retains its own character and offers different opportunities for exploration and the study of natural and cultural history. The 241,904-acre park in south-central Utah draws more than half a million visitors per year. It protects the Waterpocket Fold, a 100-mile long warp in the Earth's crust, as well as the unique historical and cultural history of the area. Death Valley is the largest national park unit outside of Alaska and includes more than 3 million acres of wilderness area. This large desert, nearly surrounded by high mountains, contains the lowest point in the Western Hemisphere. The area includes Scotty's Castle, the grandiose home of a famous prospector, and other remnants of gold and borax mining. 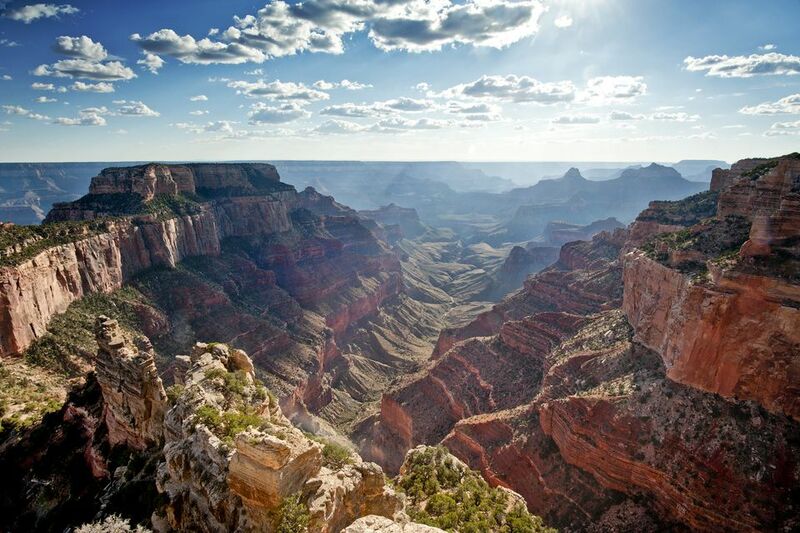 About 5 million people visit Grand Canyon National Park each year, and it comes as no surprise why. The main attraction, Grand Canyon, is a mammoth gorge stretching 277 miles and showcasing amazing depths of colorful geology. It boasts some of the nation's cleanest air, and a great deal of the park's 1,904 square miles are maintained as wilderness. Visitors cannot help but be blown away by stunning views from almost any vantage point. This 77,180-acre Nevada park draws only about 80,000 visitors a year, making it one of the least visited of the U.S. national parks. Among its natural features are streams; lakes; abundant wildlife; a variety of forest types, including groves of ancient bristlecone pines; and numerous limestone caverns, including Lehman Caves. The 1,017,748-acre park draws more than 1.3 million visitors per year. Few areas more vividly illustrate the contrast between high and low desert. Yosemite is home to some of the nation's most spectacular waterfalls, meadows, and ancient sequoia trees. Within its 1,200 miles of wilderness, visitors can find everything nature defines as beauty—wildflowers, animals grazing, crystal-clear lakes, and amazing domes and pinnacles of granite. Located in Utah's high plateau country, the Virgin River has carved a gorge so deep that sunlight rarely reaches the bottom. The canyon is wide and completely stunning, with sheer cliffs dropping some 3,000 feet. Weathered sandstone shines red and white and creates amazing sculptured rocks, cliffs, peaks, and hanging valleys. Driving directions from Las Vegas, Nevada, to Zion National Park, Utah.